Photo courtesy of Matthew Stone. Found at a music club in Kyoto, Japan. Father, I have sinned… ouch! Remember to rock the room before you go out. Hmm. Heaven or hell. Which tour do I want to take? Got one for purgatory? We will, we will …lock you. We will , we will lock you. Pull down on the handre to rock it! I wanna lock and loll all niight! I w2ill have the all inclusive Rundfahrteskarte danke. If you open the door unexpectedly I may be embarearsed. Solly sir. This dooor is velly rocked. You can’t push rock down. Oh wait, you can. 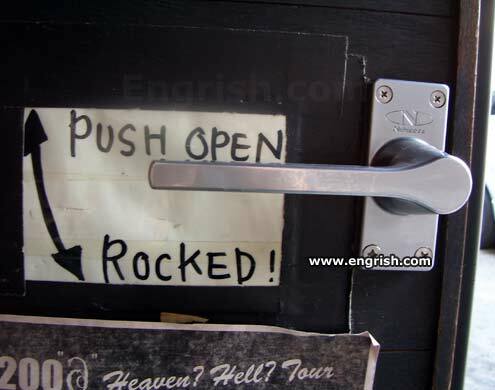 If door is crosed, unrock and roll. Love shack, baby, that’s where it’s at. This door was PSI Rockin, but i un-rocked it. Lets’ get, lets’ get, lets’ get, lets’ get, lets’ get locked! I like that old-time Locked ‘n’ roll, that kinda music just (push open) my soul I wanna think about the days of old With that old-timing Lock ‘n’ Loll. Hey, anyone mentioned the down caption?